NORTH RIVERSIDE, Ill. (Sept. 13, 2018) - With a difficult course facing Illinois State Senior Amateur players once again, East Peoria’s Tim Sheppard was able to maneuver Riverside’s tight track and slick greens en route to firing a 1-under 70 in Thursday’s second round at Riverside Golf Club. With one round to play, Sheppard leads by four strokes over Ted Pecora at 6 over and defending champion Tom Kearfott at 7 over. Sheppard began his round on Riverside’s back nine with two birdies in three holes before a bogey on the par-3 13th. He was able to add two straight birdies, on Nos. 15 and 16, before another bogey on No. 17 put him 2 under at the turn. A birdie on the par-4 sixth, sandwiched between bogeys on Nos. 5 and 7, saw Sheppard finish with the lone sub-par round of the day. 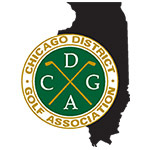 Pecora, the runner-up in the CDGA Senior Amateur Championship earlier this summer, was able to overcome a slow start on Riverside’s back nine that featured three straight bogeys on Nos. 11-13. He played his back nine in 2 under to right the ship and finish with a 1-over 72, positioning himself within striking distance come Friday. The defending champion Kearfott was able to best his opening-round 75 by one stroke, shooting a 3-over 74. His lone birdie on the day came on No, 8, a 401-yard par 4. Kearfott, who partnered with Sheppard to win the 2016 CDGA Senior Amateur Four-Ball Championship at Crystal Tree Golf & Country Club, was able to manage his pace on the greens and control his driver off the tee. Dale Blankenship and Daniel Moran earned co-low super senior champion (65 and older) honors on Thursday, both wrapping up the second round with a score of 155, after each shot rounds of 79 and 76. Thirty-eight players made the cut, with tee times for Friday’s final round beginning at 8 a.m. The trio of Sheppard, Pecora and Kearfott tees off at 9:48 a.m.
Open to senior amateurs who are residents of the state of Illinois. A 54-hole event with the entire field playing 36 holes over the course of two days and the low 30 and ties play the final 18 on the third day.